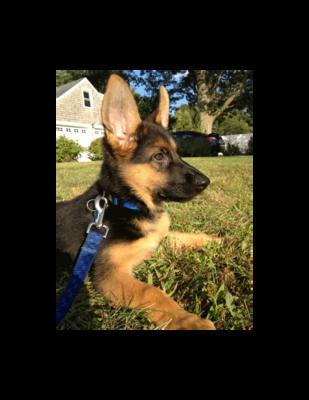 Dolce is now 11 weeks old and came from Von Den Brookfields in New Braintree, Mass near historic Sturbridge Village. From day one she has been a ball of fire and is afraid of nothing, barking at even the biggest dogs. She goes to day care Monday-Friday so is already well socialized and very friendly and affectionate. We got her after we lost our Bella a few months ago at just 2 years age to lymphoma. Total German Shepherd: Bob, Thanks so much for sharing your beautiful new German Shepherd Puppy Dolce with us. She is gorgeous!! I absolutely love the picture you have sent of her. So if she is a ball of fire already then you have no where to go but up! Definitely get her into some sort of training program if you can as soon as possible - and if she is high drive agility might be a good option as well as Schutzhund. But the fact that she is already being socialized on a day to day basis, that definitely will help her adjust to things so much faster as an adult. And you'll be well on your way to having a stable and well adjusted dog - which is the best of all worlds. Good luck with your precious new GSD puppy. I wish you loads of fun and enjoyment and many more years to come. What a Beauty Dolce is! This puppy year is so important and do enjoy this is precious time. German Shepherds are so amazing they have it all; intelligent, loyal, trustworthy, protective, playful and gentle. Take care of your precious girl Dolce and she will take care of you!